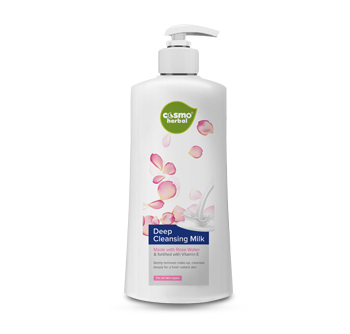 Cosmo Herbal’s cleansing milk is a gentle approach to cleanse your skin without stripping it of its natural oils. Milk being highly effective as a traditional skin care ingredient, works wonders in keeping the skin naturally hydrated and supple. Catering skin health in a bit more organic fashion is Cosmo Herbal Deep Cleansing Milk that cleanses skin pores to their core. It comes infused with Weatgerm oil and Aloevera that work wonders in removing impurities, dirt, make-up and excess oil from the skin. Available in 100ml, 300ml, 800ml Bottles with pump.